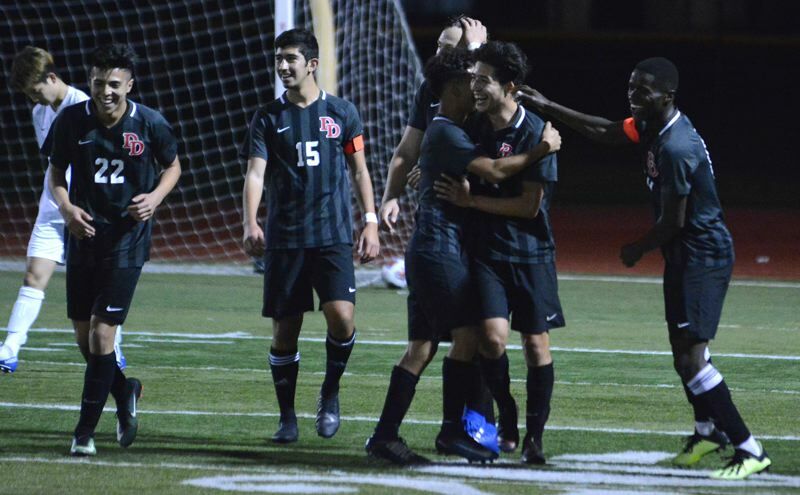 David Douglas continued to roll through the boys soccer playoffs with a 4-0 win over Beaverton in Tuesday's second round. The Scots took quick command of the game when Isaac Rangel Villafuerte played a through ball into the center of the 18-yard box. Teammate Rigo Mendez came through on a perfectly timed run that left him 1-on-1 with the keeper. "I took a look at the goalie, a look at the ball, picked a side and hit my shot," Mendez said. "We tried to attack as much as we could in that first 10 minutes. We wanted to secure this game early." Mendez would strike again with a sharp-angled shot far post assisted by Miguel Ordaz. The Scots nearly made in 3-0 in the first 10 minutes when Villafuerte got loose at the front of the goal and forced Beaverton goalie Alexis Ojeda to make a point-blank save. David Douglas got second-half goals by Villafuerte and Richie Valdez to close out the team's third straight shutout win. The No. 3-seed Scots (12-2-2) host No. 6 West Linn (11-2-3), the Three Rivers League runner-up, in a quarterfinal match Saturday. No. 1 Central Catholic dropped a 3-2 decision to Aloha on Tuesday night, making David Douglas the last Mount Hood Conference team standing. Look for expanded coverage ahead in our Friday, Nov. 2, print edition.